(Nanowerk News) Researchers have designed a thin plastic membrane that stops rechargeable batteries from discharging when not in use and allows for rapid recharging. The patent-pending technology controls how charge flows inside a battery, and was inspired by how living cell membranes transport proteins in the body. It could find applications in high powered “supercapacitors” for electric cars and even help prevent the kinds of fires that plagued some models of hoverboards recently. In the journal Energy & Environmental Science ("Ionic redox transistor from pore-spanning PPy(DBS) membranes"), the Ohio State University engineers describe the “smart” membrane that they hope will enable the development of a new category of fast-charging and powerful batteries called “redox transistor batteries” for automobiles that will travel farther on a single charge. Along the way, they analyzed the performance of the leading hybrid and electric car batteries, and discovered something that, to their knowledge, has never before been stated outright. The best eco-car makers appear to have hit a performance limit, and that limit is 0.4 miles—less than half a mile of driving—per minute of charging. Put another way, today’s very best eco-friendly cars can travel around 200 miles after an 8-hour charge, while gas-powered cars can cover the same distance after only one minute spent at the pump. The researchers hope their new technology can boost electric car batteries to provide up to tens of miles per minute of charge. “That’s still an order of magnitude away from the equivalent measure in gasoline, but it’s a place to start,” said Vishnu-Baba Sundaresan, an assistant professor of mechanical and aerospace engineering at Ohio State and leader of the study. Sundaresan said that today’s hybrid and electric cars are hitting the performance limit because of how charge is stored in conventional batteries. He also believes that his new membrane technology might be the only way to push past that limit until entirely a new category of battery electrodes are developed. Sundaresan and doctoral student Travis Hery call their invention an “ionic redox transistor,” and they’re using it to develop a new kind of battery in which energy is stored in a liquid electrolyte—which people can recharge or empty out and refill as they would refill a gas tank. “For everyday commuting, the electrolyte can be simply regenerated by plugging it into a power outlet overnight or while parked at the garage. For long road trips, you could empty out the used electrolyte and refill the battery to get the kind of long driving range we are accustomed to with internal combustion engines,” Sundaresan said. Batteries such as lithium-ion batteries already have membrane separators that conduct charge and physically separate the anode and the cathode from each other, but even the best of these batteries lose charge over time. That’s because membranes can’t completely prevent charge from leaking between the anode and cathode, explained doctoral student Travis Hery. The internal chemical reactions are called self-discharge. In the best-case scenario, self-discharge slowly converts some of the battery’s internal energy into heat—a gradual power drain. In the worst-case scenario, the leakage causes batteries to overheat and even catch fire, as recently happened with the popular lithium-ion-powered hoverboards and Boeing’s environmentally friendly Dreamliner fleet. The phenomenon is called thermal runaway, and there are very few ways to shut it down once it starts. But Sundaresan and Hery believe their membrane, when used with a specially designed electronic control unit, can shut down charge transport and prevent thermal runaway at its onset. The design is inspired by cell membranes in the body, which open and close to let cells perform biological functions. Openings in the cell wall respond to the electrical charge of molecules to expand or contract, and it’s this principle that the engineers applied to the smart membrane. They combined an electrically conductive polymer with a polycarbonate filter used for air and water testing. 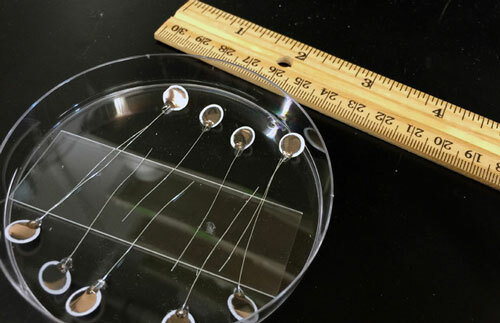 By controlling how they grew the conductive polymer chains on the polycarbonate surface, the researchers found they could control the density of openings in the resulting membrane. When the battery is charging or discharging, the conductive polymer shrinks to open the holes. When the battery isn’t in use, the polymer swells to close the holes. In laboratory tests, the engineers found that their membrane reliably controlled charging and discharging in batteries powered by ions of lithium, sodium and potassium. They connected batteries to an LED light, programming the holes to open and close in precise patterns. The membrane allowed the batteries to function normally, but reduced charge loss to zero when the batteries were not in use. The university will license the technology to industry for further development. The same technology could prevent self-discharge in supercapacitors, which give high power and rapid recharge capability to some electric cars, buses and light rail transit systems.